Ovens get dirty: Roasting meat spatters; lasagna overflows; pies drip. Soon you have a black, petrified crust coating the inside of your appliance. Globs of fat are bad — fossilized sugars are even worse. Ordinary oven cleaning forces you to get down on your knees and scrub like mad. Alternatively, you can saturate the stains with toxic chemicals and hope for the best. What’s a body to do? Way back in 1963, General Electric came up with a solution: the self-cleaning oven. The company’s innovative P7 model introduced the pyrolytic cleaning method [source: GE Appliances]. That was a fancy name for heating the residue until it carbonized and turned to ash. The oven included extra thermodynamic controls to allow it to reach the high temperatures needed. Today, another option is the steam-cleaning oven, which loosens dirt without resorting to extremes of heat. Self-cleaning is a slight exaggeration — you still need to get involved. You’ll want to remove any drippings or build-up that come off easily before turning on the self-cleaning cycle in order to reduce smoke and fumes. And no matter which self-cleaning method you choose, you’ll need to wipe up the residue when the cleaning cycle is over. As you can imagine, the heat needed for the self-clean cycle requires a lot of energy. The ovens can also give off a smell like barbecued roadkill, especially while burning off thick layers of grime. And the fumes they emit can be toxic to pet birds. But for the most part, self-cleaning ovens are a boon for anyone who bakes. They let you toss out your chemical cleaners. They clean the whole oven, even those hard-to-reach areas, without excess elbow grease. As a bonus, pyrolytic ovens save energy during normal baking because of the extra insulation that’s added to contain the high heat. In the next section, you’ll open the oven door and take a look at how the different types of self-cleaning mechanisms work. The term “self-cleaning oven” usually refers to the pyrolytic cleaning method. This type of oven has a smooth enamel coating on the interior walls that makes it easier to remove dirt after it’s reduced to ash by high heat. Pyrolytic ovens have a timed cleaning cycle, usually ranging from two to four hours. During the cycle, the oven heats to between 900 and 1,000 degrees Fahrenheit (482 to 537.8 degrees Celsius). The heat reduces the baked-on crust and grease to a powder that’s easy to remove. Since the process creates smoke and fumes, some pyrolytic self-cleaning ovens use a catalytic converter in the exhaust vent to eliminate emissions. You’ll also find ovens that feature steam cleaning. These are lined with a proprietary enamel coating. When activated by steam and low heat, the walls of the oven release dirt. All you have to do is wipe it away. Steam cleaning is quicker than pyrolytic cleaning — it usually takes less than an hour. The ovens don’t need high temperatures and don’t give off fumes. But they don’t clean as thoroughly as pyrolytic ovens, especially when dealing with baked-on goo. Some ovens feature both pyrolytic and steam cleaning options. You can choose which method you prefer depending on how dirty the oven is. A different technology known as continuous cleaning was used in older ovens, although it’s less popular today. The idea is to spread out the grease spatter and stains over a wide surface. So the continuous cleaning oven has a rough, porous enamel finish on its interior walls. That enamel contains catalytic substances like metal oxides that help the deposits turn to ash at normal baking temperatures. Continuous cleaning ovens are most effective for light splatters, but they don’t handle larger spills very well. If you have one, you should take precautions, such as putting a layer of foil on the bottom of the oven when baking anything that might spill. And wipe up any substantial grime as soon as you can. Using a self-cleaning oven is as easy as pushing a button, but there are a few things to keep in mind. Read on to find out what they are. Remove all pans and foil from inside the oven before you clean. Usually, you’ll need to remove the racks and wash them separately. Metal racks will discolor and be harder to slide if you leave them in. Enamel-covered racks can be cleaned along with the rest of the oven. Clean up as much baked-on food or grease as you can easily remove. You can scrape it off with a non-scratch spatula. Lock the oven door. You may need to fasten it with a lever or it may lock automatically. This prevents anyone from opening it during the cleaning cycle and being blasted by the heat. Time the cleaning using the controls provided. The time you choose depends on how dirty the oven is. Two hours is usually plenty for light cleaning. Three or four hours might be needed for a dirty oven. Let the oven cool after the cleaning cycle. The oven will turn off automatically when the cleaning cycle is over, but you won’t be able to open it until it cools down to regular baking temperatures. Wipe away ash residue with damp cloth. You can use your vacuum cleaner if the residue is loose. To use the steam-cleaning cycle, pour water into the bottom of the cool oven — the owner’s manual will tell you exactly how much. Shut the door and press the “clean” button. The cycle should take less than an hour. Don’t open the oven door during the cleaning process. When the cycle is finished, let the oven cool down. Then loosen dirt using a scrub brush or nylon scouring pad. Soak up any remaining water with a sponge or cloth and leave the door open to air-dry the oven. If you have a continuous cleaning oven, wipe up residue at least weekly. You can help the cleaning along by turning the oven to 475 degrees Fahrenheit (246 degrees Celsius) for an hour or so while it’s empty. It’s a good idea to put foil on the bottom of a continuous cleaning oven to prevent large spills from sticking. Are Oven Cleaners Necessary for Self-cleaning Ovens? Oven cleaners? No way. One of the big advantages of a self-cleaning oven is that it lets you avoid oven cleaners, which are among the most toxic of household cleaners. If you use them, any residue of oven cleaner left behind might release dangerous fumes during the self-cleaning cycle. 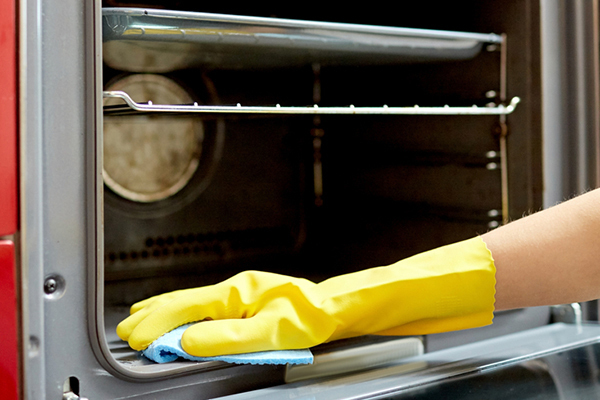 Oven cleaners contain lye and solvents, which they need to attack burned-on oven grime. The directions for these cleaners will tell you to use rubber gloves and avoid contact with your eyes or skin. Today there are less toxic cleaners labeled “safe for self-cleaning ovens.” These are based mainly on baking soda. Don’t use metal scrapers, scouring pads or wire brushes on self-cleaning or steam cleaning ovens. These can damage the interior walls and make the self-cleaning process less effective. You’ll want to avoid using either oven cleaners or abrasives on continuous cleaning ovens for the same reason. All you’ll need to clean your self-cleaning oven is a damp cloth or sponge to wipe up the powdery residue after the cleaning cycle and some mild detergent or baking soda for cleaning the areas around the door and the exterior surfaces. A water-and-lemon-juice mixture is good for removing light grease stains. Never scrub or put cleaner on the fiberglass gasket around the oven door to avoid damaging the oven’s seal. When you use the self-cleaning cycle, turn on the fan in the hood that’s attached to outside vent. Open windows in the kitchen for ventilation. You could put a fan in the window if needed. This will get rid of any smoke or fumes as well as some of the heat. It’ll help keep your smoke detector from sounding an alarm, too. Don’t leave the oven completely unattended while cleaning. You’ll want to avoid touching the outside of the oven, as it can get hot. Always keep children away. And be aware that birds are highly sensitive to toxic gases and smoke. If you have pet birds, put them in a room with good ventilation while the oven is cleaning. A quality self-cleaning oven should give you years of happy baking and eliminate one of your least favorite household chores.